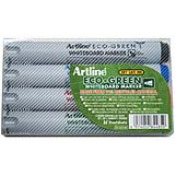 Artline ECO-GREEN markers are re-fillable and Nib Tip Changeable. ECO-GREEN Permanent markers contain more than 74% recycled content and are made from 100% recycled material. they utilize dry safe technology which keeps them from drying out even without their cap for u to 2 weeks. Durable fiber nibs for years of service under the toughest conditions. 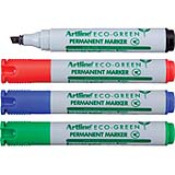 These permanent markers create bold markings on cartons, crates and a variety of surfaces TAA Compliant. 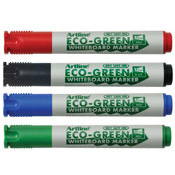 ECO-GREEN Whiteboard markers contain 78% recycled content and are made from 100% recycled material. Theyu utilize dry safe technology which keeps them from drying out even without their cap for up to 2 weeks! 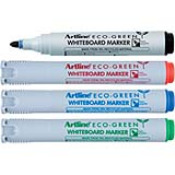 These whiteboard markers are perfect for presentations and are visible from a distance. TAA Compliant. 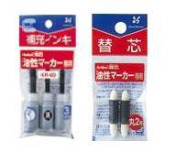 Check out our Accessories: Our Artline Magnetic Erasers and our Refill Ink and Replacement Nibs. All with our Manufacturer's Satisfaction Guarantee.